New in version 8.0: This page documents the New API added in Odoo 8.0 which should be the primary development API going forward. It also provides information about porting from or bridging with the "old API" of versions 7 and earlier, but does not explicitly document that API. See the old documentation for that. Interaction with models and records is performed through recordsets, a sorted set of records of the same model. contrary to what the name implies, it is currently possible for recordsets to contain duplicates. This may change in the future. Trying to read or write a field on multiple records will raise an error. Accessing a relational field (Many2one, One2many, Many2many) always returns a recordset, empty if the field is not set. To avoid reading one field on one record at a time, Odoo prefetches records and fields following some heuristics to get good performance. Once a field must be read on a given record, the ORM actually reads that field on a larger recordset, and stores the returned values in cache for later use. The prefetched recordset is usually the recordset from which the record comes by iteration. Moreover, all simple stored fields (boolean, integer, float, char, text, date, datetime, selection, many2one) are fetched altogether; they correspond to the columns of the model's table, and are fetched efficiently in the same query. Recordsets are immutable, but sets of the same model can be combined using various set operations, returning new recordsets. Set operations do not preserve order. Recordsets are iterable so the usual Python tools are available for transformation (map(), sorted(), itertools.ifilter, ...) however these return either a list or an iterator, removing the ability to call methods on their result, or to use set operations. The Environment stores various contextual data used by the ORM: the database cursor (for database queries), the current user (for access rights checking) and the current context (storing arbitrary metadata). The environment also stores caches. The environment can be customized from a recordset. This returns a new version of the recordset using the altered environment. assert len(records) == 1, "Expected singleton"
For the various field types and parameters, see the fields reference. When a user changes a field's value in a form (but hasn't saved the form yet), it can be useful to automatically update other fields based on that value e.g. updating a final total when the tax is changed or a new invoice line is added. will not trigger any interface update when the field is edited by the user, even if there are function fields or explicit onchange depending on that field. It is not possible for a one2many or many2many field to modify itself via onchange. This is a webclient limitation - see #2693. Because models use the same cursor and the Environment holds various caches, these caches must be invalidated when altering the database in raw SQL, or further uses of models may become incoherent. It is necessary to clear caches when using CREATE, UPDATE or DELETE in SQL, but not SELECT (which simply reads the database). Clearing caches can be performed using the invalidate_cache() method of the BaseModel object. By default, methods are assumed to use the new API style and are not callable from the old API style. the function is assumed to return a recordset, the first parameter should be the name of the recordset's model or self (for the current model). Main super-class for regular database-persisted Odoo models. The system will later instantiate the class once per database (on which the class' module is installed). Name of the table backing the model created when _auto, automatically generated by default. 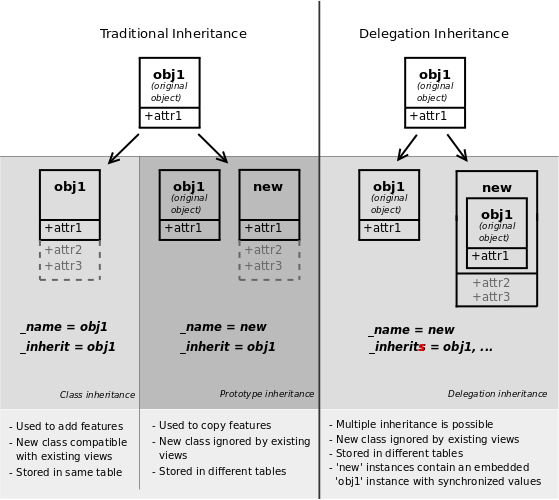 implements composition-based inheritance: the new model exposes all the fields of the _inherits-ed model but stores none of them: the values themselves remain stored on the linked record. Creates a new record for the model. The new record is initialized using the values from vals and if necessary those from default_get(). Returns a recordset for the ids provided as parameter in the current environment. Can take no ids, a single id or a sequence of ids. Updates all records in the current set with the provided values. will set the field foo to 1 and the field bar to "Qux" if those are valid (otherwise it will trigger an error). One2many and Many2many use a special "commands" format to manipulate the set of records stored in/associated with the field. adds a new record created from the provided value dict. updates an existing record of id id with the values in values. Can not be used in create(). removes the record of id id from the set, then deletes it (from the database). Can not be used in create(). removes the record of id id from the set, but does not delete it. Can not be used on One2many. Can not be used in create(). adds an existing record of id id to the set. Can not be used on One2many. removes all records from the set, equivalent to using the command 3 on every record explicitly. Can not be used on One2many. Can not be used in create(). replaces all existing records in the set by the ids list, equivalent to using the command 5 followed by a command 4 for each id in ids. Values marked as _ in the list above are ignored and can be anything, generally 0 or False. Reads the requested fields for the records in self, low-level/RPC method. In Python code, prefer browse(). groupby (list) -- list of groupby descriptions by which the records will be grouped. A groupby description is either a field (then it will be grouped by that field) or a string 'field:groupby_function'. Right now, the only functions supported are 'day', 'week', 'month', 'quarter' or 'year', and they only make sense for date/datetime fields. lazy (bool) -- if true, the results are only grouped by the first groupby and the remaining groupbys are put in the __context key. If false, all the groupbys are done in one call. Searches for records based on the args search domain. args -- A search domain. Use an empty list to match all records. if user tries to bypass access rules for read on the requested object. Returns the number of records in the current model matching the provided domain. Search for records that have a display name matching the given name pattern when compared with the given operator, while also matching the optional search domain (args). This is used for example to provide suggestions based on a partial value for a relational field. Sometimes be seen as the inverse function of name_get(), but it is not guaranteed to be. This method is equivalent to calling search() with a search domain based on display_name and then name_get() on the result of the search. operator (str) -- domain operator for matching name, such as 'like' or '='. list of pairs (id, text_repr) for all matching records. Verifies that the current recorset holds a single record. Raises an exception otherwise. By convention, new records are returned as existing. Select the records in self such that func(rec) is true, and return them as a recordset. Return the recordset self ordered by key. Apply func on all records in self, and return the result as a list or a recordset (if func return recordsets). In the latter case, the order of the returned recordset is arbitrary. Returns a new version of this recordset attached to the provided user. By default this returns a SUPERUSER recordset, where access control and record rules are bypassed. Using sudo could cause data access to cross the boundaries of record rules, possibly mixing records that are meant to be isolated (e.g. records from different companies in multi-company environments). It may lead to un-intuitive results in methods which select one record among many - for example getting the default company, or selecting a Bill of Materials. Because the record rules and access control will have to be re-evaluated, the new recordset will not benefit from the current environment's data cache, so later data access may incur extra delays while re-fetching from the database. The returned recordset has the same prefetch object as self. Returns a new version of this recordset attached to an extended context. The new environment will not benefit from the current environment's data cache, so later data access may incur extra delays while re-fetching from the database. The returned recordset has the same prefetch object as self. Return the definition of each field. The returned value is a dictionary (indiced by field name) of dictionaries. The _inherits'd fields are included. The string, help, and selection (if present) attributes are translated. Return default values for the fields in fields_list. Default values are determined by the context, user defaults, and the model itself. a dictionary mapping each field name to its corresponding default value, if it has one. Returns a textual representation for the records in self. By default this is the value of the display_name field. Create a new record by calling create() with only one value provided: the display name of the new record. The new record will be initialized with any default values applicable to this model, or provided through the context. The usual behavior of create() applies. default value for _rec_name, used to display records in context where a representative "naming" is necessary. This module provides the elements for managing two different API styles, namely the "traditional" and "record" styles. In the "traditional" style, parameters like the database cursor, user id, context dictionary and record ids (usually denoted as cr, uid, context, ids) are passed explicitly to all methods. In the "record" style, those parameters are hidden into model instances, which gives it a more object-oriented feel. Methods written in the "traditional" style are automatically decorated, following some heuristics based on parameter names. Notice that no ids are passed to the method in the traditional style. One may also pass a single function as argument. In that case, the dependencies are given by calling the function with the field's model. Invoked on the records on which one of the named fields has been modified. Should raise ValidationError if the validation failed. @constrains will be triggered only if the declared fields in the decorated method are included in the create or write call. It implies that fields not present in a view will not trigger a call during a record creation. A override of create is necessary to make sure a constraint will always be triggered (e.g. to test the absence of value). In the form views where the field appears, the method will be called when one of the given fields is modified. The method is invoked on a pseudo-record that contains the values present in the form. Field assignments on that record are automatically sent back to the client. Return a decorator for methods that return instances of model. The arguments self, *args and **kwargs are the ones passed to the method in the record-style. Note that the decorated method must satisfy that convention. Those decorators are automatically inherited: a method that overrides a decorated existing method will be decorated with the same @returns(model). Deprecated since version 9.0: one() often makes the code less clear and behaves in ways developers and readers may not expect. It is strongly recommended to use multi() and either iterate on the self recordset or ensure that the recordset is a single record with ensure_one(). Note that the wrapper method uses the docstring of the first method. string -- the label of the field seen by users (string); if not set, the ORM takes the field name in the class (capitalized). states -- a dictionary mapping state values to lists of UI attribute-value pairs; possible attributes are: 'readonly', 'required', 'invisible'. Note: Any state-based condition requires the state field value to be available on the client-side UI. This is typically done by including it in the relevant views, possibly made invisible if not relevant for the end-user. One can define a field whose value is computed instead of simply being read from the database. The attributes that are specific to computed fields are given below. To define such a field, simply provide a value for the attribute compute. The compute method has to assign the field on all records of the invoked recordset. The decorator odoo.api.depends() must be applied on the compute method to specify the field dependencies; those dependencies are used to determine when to recompute the field; recomputation is automatic and guarantees cache/database consistency. Note that the same method can be used for several fields, you simply have to assign all the given fields in the method; the method will be invoked once for all those fields. By default, a computed field is not stored to the database, and is computed on-the-fly. Adding the attribute store=True will store the field's values in the database. The advantage of a stored field is that searching on that field is done by the database itself. The disadvantage is that it requires database updates when the field must be recomputed. The inverse method, as its name says, does the inverse of the compute method: the invoked records have a value for the field, and you must apply the necessary changes on the field dependencies such that the computation gives the expected value. Note that a computed field without an inverse method is readonly by default. The search method is invoked when processing domains before doing an actual search on the model. It must return a domain equivalent to the condition: field operator value. Some field attributes are automatically copied from the source field if they are not redefined: string, help, readonly, required (only if all fields in the sequence are required), groups, digits, size, translate, sanitize, selection, comodel_name, domain, context. All semantic-free attributes are copied from the source field. By default, the values of related fields are not stored to the database. Add the attribute store=True to make it stored, just like computed fields. Related fields are automatically recomputed when their dependencies are modified. Formerly known as 'property' fields, the value of those fields depends on the company. In other words, users that belong to different companies may see different values for the field on a given record. A field is defined as class attribute on a model class. If the model is extended (see Model), one can also extend the field definition by redefining a field with the same name and same type on the subclass. In that case, the attributes of the field are taken from the parent class and overridden by the ones given in subclasses. Basic string field, can be length-limited, usually displayed as a single-line string in clients. translate -- enable the translation of the field's values; use translate=True to translate field values as a whole; translate may also be a callable such that translate(callback, value) translates value by using callback(term) to retrieve the translation of terms. Very similar to Char but used for longer contents, does not have a size and usually displayed as a multiline text box. selection -- specifies the possible values for this field. It is given as either a list of pairs (value, string), or a model method, or a method name. selection_add -- provides an extension of the selection in the case of an overridden field. It is a list of pairs (value, string). The attribute selection is mandatory except in the case of related fields or field extensions. Return the current date as seen in the client's timezone in a format fit for date fields. This method may be used to compute default values. Convert an ORM value into a date value. Convert a date value into the format expected by the ORM. Return the current day in the format expected by the ORM. This function may be used to compute default values. Returns the given timestamp converted to the client's timezone. This method is not meant for use as a default initializer, because datetime fields are automatically converted upon display on client side. For default values fields.datetime.now() should be used instead. Convert an ORM value into a datetime value. Return the current day and time in the format expected by the ORM. This function may be used to compute default values. Convert a datetime value into the format expected by the ORM. The value of such a field is a recordset of size 0 (no record) or 1 (a single record). The attribute comodel_name is mandatory except in the case of related fields or field extensions. One2many field; the value of such a field is the recordset of all the records in comodel_name such that the field inverse_name is equal to the current record. The attributes comodel_name and inverse_name are mandatory except in the case of related fields or field extensions. Many2many field; the value of such a field is the recordset. The attributes relation, column1 and column2 are optional. If not given, names are automatically generated from model names, provided model_name and comodel_name are different! When using the _inherit and _name attributes together, Odoo creates a new model using the existing one (provided via _inherit) as a base. The new model gets all the fields, methods and meta-information (defaults & al) from its base. "This is model 0 record A"
"This is model 1 record B"
the second model has inherited from the first model's check method and its name field, but overridden the call method, as when using standard Python inheritance. matches field_name against the value pattern. An underscore _ in the pattern stands for (matches) any single character; a percent sign % matches any string of zero or more characters. is a child (descendant) of a value record. Takes the semantics of the model into account (i.e following the relationship field named by _parent_name). logical AND, default operation to combine criteria following one another. Arity 2 (uses the next 2 criteria or combinations). Individual criterion generally have a negative form (e.g. = -> !=, < -> >=) which is simpler than negating the positive. methods still written in the old API should be automatically bridged by the ORM, no need to switch to the old API, just call them as if they were a new API method. See Automatic bridging of old API methods for more details. when straight conversion is impossible (semantics can not be bridged) or the "old API" version is not desirable and could be improved for the new API, it is possible to use completely different "old API" and "new API" implementations for the same method name using v7() and v8(). The method should first be defined using the old-API style and decorated with v7(), it should then be re-defined using the exact same name but the new-API style and decorated with v8(). Calls from an old-API context will be dispatched to the first implementation and calls from a new-API context will be dispatched to the second implementation. One implementation can call (and frequently does) call the other by switching context. uses of _columns or _all_columns should be replaced by _fields, which provides access to instances of new-style odoo.fields.Field instances (rather than old-style odoo.osv.fields._column). When models are initialized, all methods are automatically scanned and bridged if they look like models declared in the old API style. This bridging makes them transparently callable from new-API-style methods. Methods are matched as "old-API style" if their second positional parameter (after self) is called either cr or cursor. The system also recognizes the third positional parameter being called uid or user and the fourth being called id or ids. It also recognizes the presence of any parameter called context. When calling such methods from a new API context, the system will automatically fill matched parameters from the current Environment (for cr, user and context) or the current recordset (for id and ids). will loop over the current recordset and call the method once for each record, prepending the current cursor, user's id and record's id to explicitly provided parameters. All of these methods have a _context-suffixed version (e.g. cr_uid_context()) which also passes the current context by keyword. dual implementations using v7() and v8() will be ignored as they provide their own "bridging"